Raheem Sterling started and ended the scoring and Ilkay Gundogan also netted in the first quarter of the game as City ended what could have been a testing week with a trip to Everton in between the visits of Arsenal and Chelsea with maximum points.Jurgen Klopp’s men maintain the advantage of a game in hand, but handed a reprieve by Liverpool’s draws against Leicester and West Ham in recent weeks, City look determined to become the first side in a decade to retain the Premier League. And this was their worst loss in any competition since 1991 after failing to recover from Sterling’s fourth-minute opener.Eden Hazard went to sleep from Kevin de Bruyne’s quickly taken free-kick and Bernardo Silva had acres of space to cross for the England international to fire home. But the Catalan coach need not have worried that would prove a costly miss as Aguero made amends in stunning fashion by blasting into the top corner from 25 yards to double City’s after just 13 minutes.Aguero had a simple task to make it 3-0 six minutes later when he pounced on Ross Barkley’s slack header towards his own goal. 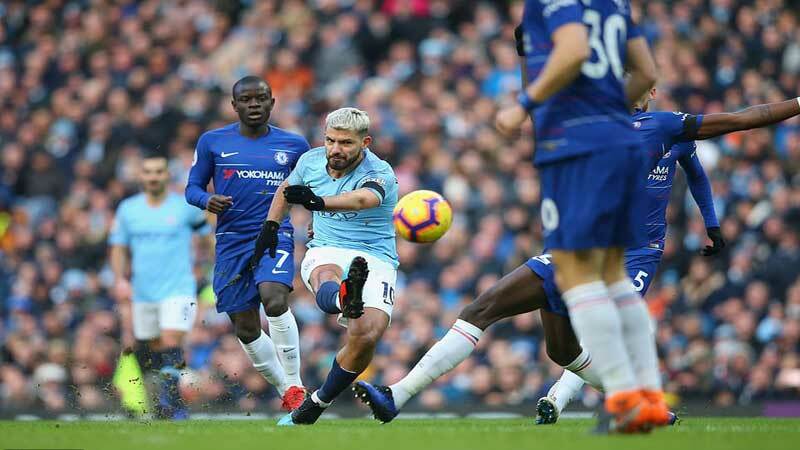 That was as much of a response as Chelsea mustered, though, and it only got worse for Sarri’s chances of keeping his job in the second period.Aguero missed his first chance to seal a second hat-trick in two games when he headed against the crossbar. But when Sterling was too quick for Cesar Azpilicueta and chopped down by the Spaniard inside the area, Aguero coolly slotted home from the penalty spot to move level with Liverpool’s Mohamed Salah as the Premier League’s top scorer on 17 for the season. And Silva’s pass opened the visitors up again for the sixth as he picked out Oleksandr Zinchenko who crossed for Sterling to tap home.AFP.